Universitas Gadjah Mada and Konstanz University of Applied Sciences, Germany, have agreed to establish cooperation in education and teaching through student and lecturer exchange as well as joint research. This was put into an agreement that was signed by Rector of UGM, Prof. Ir. Panut Mulyono, M. Eng., Ph.D., and Rector of Konstanz University of Applied Sciences, Prof. Dr. Carsten Manz, on Tuesday (12/3) at UGM Main Office. 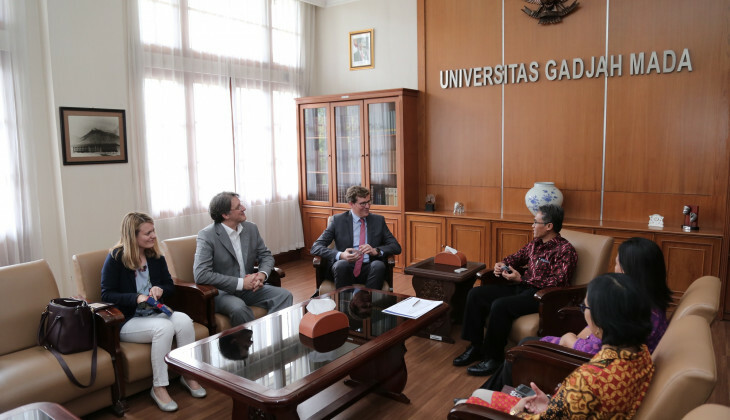 The Rector of UGM appreciated the cooperation to enhance academic activities of both parties. According to the Rector, the cooperation would not only cover academic matters but also other areas to increase international reputation and recognition. “This collaboration will enhance the reputation and recognition of UGM at the international level,” said Panut. Through the cooperation, he said, the student and lecturer exchange programme was expected to increase that can benefit in terms of academic and research projects. “We also want to have students from Konstanz University here,” he said. Meanwhile, Prof. Dr. Carsten Manz, revealed his intention to cooperate with UGM that he learned as the study place of President Joko Widodo. He hoped his visit to UGM would sustain and benefit both universities. “We are open to ideas on cooperation to encourage and promote academic events,” he said. Reportedly, the academic cooperation comes in the form of student exchange, training for teaching and non-teaching staff, academic publication and information exchange, and joint seminar and symposium. Disciplines to be developed further consist of language and culture, business and management, social sciences and economics, computer science, information technology and engineering.